The GW.05 dual band WiFi Hinged Rotatable Antenna is a high efficiency monopole antenna. Compared to other much larger antennas on the market, it has superior wide-band high efficiency characteristics. 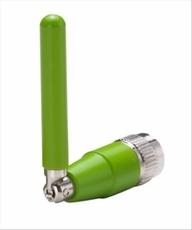 The bright green colour of the antenna adds a unique quality look and feel to any modern WiFi application point, device or router. It also provides differentiation if using Taoglas other similar looking antennas (such as the black color Taoglas TG.09 cellular antenna) on same device. The connector used is Rev SMA(M), the standard mating part for an antenna to most WiFi application points and routers in the market. The GW.05, as all monopole antennas, works best connected directly to the ground-plane of the device main PCB or to the outside of a metal housing. However it still has very good performance (>50%) even without connecting to a ground-plane, making it the best all round small WiFi terminal antenna on the market. In the un-grounded installation condition it also comes below the max peak gain requirements for most WiFi modules which are usually 2dBi, so it can comply with FCC regulations. The GW.05 is for Wi-Fi, WLAN, Zigbee, Bluetooth, and 802.11a/b/g/n/ac applications.